Quickly find all types of forklift rentals from top rated forklift rental companies. Compare price quotes from a few of the leading forklift rental companies in your area. Comparing rates was easy, I just filled out a quote request and was emailed by three forklift rental companies in my area with rates on a 3,000 lbs. forklift. I was searching for a short-term 7,500 lbs forklift rental that could be used both indoors and outdoors, and RentalForce.com was the only place I could find it. Rental Force was easy to use and I had a forklift delivered the next day. Save Time - fill out just one quick quote form and we'll match you to companies offering the lift truck or forklift you're looking for. Save Money - you'll get prices on forklift rentals from a few of the top companies in your area. 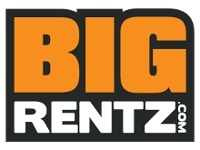 Rent from the top forklift companies - rent from the most dependable forklift companies. Lift Capacity - lift capacity is measured in lbs., and the typical forklift rental is around 3,000-5,000 lbs. You can find heavy duty industrial lift trucks that can lift up to 50,000 lbs. Lift Height - lift height is usually measured in inches, with some lifts capable of reaching heights of over 192 inches (16 feet). Engine Type - The three most common engine types are electric, gasoline and diesel. It's important to know where you will be using your forklift in order to pick the right one for your needs. How Much Does a Forklift Rental Cost? Forklift rental rates vary depending on the type you need, the lift capacity, your location and the rental duration. You can rent a small 3,000 lbs forklift for as low as $100 a day, while large capacity 20,000 lbs forklifts can cost more than $600 per day. What Types of Forklift Rentals Are Available? Rental Force makes it easy to find all types of forklift rentals including electric forklift rentals, sit down rider forklift rentals, narrow aisle forklift rentals, rough terrain forklift rentals, order picker rentals and more. You'll find lift truck rentals with lift capacities ranging from 3,000 lbs. to more than 50,000 lbs. Does a Forklift Operator Need Certification/Training? Yes, operating a forklift can be extremely dangerous not only to the operator but to other employees as well. All forklift drivers should undergo proper training and certification classes. Who Are the Top Forklift Manufacturers? There are many great forklift manufacturers, including Toyota, Case, Komatsu, Nissan, Yale, Hyster, Raymond, Crown and more. How Much Does Forklift Delivery Cost? Many companies will offer free delivery, but for those that do charge it's usually around $75 - $125 each way.